1963 Ron Malibu 9 ft 7"
Foam blank, 1/2" redwood stringer and tailblock. Fibreglassed, pigment decor. Black script/text with black Noseride graphic at tail. Deck: pigmented lime green rail panels and multi-thin stripes. Bottom: pigmented aqua rail panels and with offset clear multi-thin stripes. Victorian Agent : J.P. O'Day 153 Nepean Highway, Melbourne. Geoff McCoy finish coating, progressing to shaping (1962?). These two would form M and M Surfboards in 1967. William Morton continued manufacturing as WM Surfboards. Geoff McCoy left the company circa 1967 to shape at Bennett Surfboards. 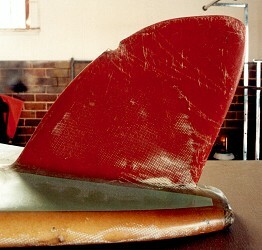 Shaping at Keyo Surfboards followed, circa 1968. 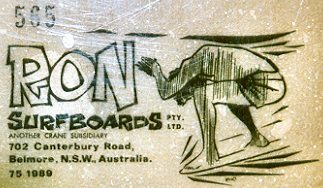 He formed his own company, McCoy Surfboards, 11 August 1970 at Brookvale NSW. The use of different colours on the deck and bottom is unusual for this period. CONDITION: 7, extensive staining to bottom. #182 Ron Export Quality, circa 1965. 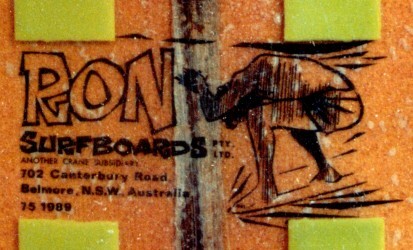 #52 Ron Gun-narrow tail template, circa 1965.